That’s what makes events at L’Auberge Casino & Hotel so seamless, and so unforgettable. With an experienced staff and beautifully furnished spaces, we welcome events of all sizes and occasions. Let our enthusiastic professionals handle every detail to ensure your next gathering is an utter success. EVERYDAY IS SUNDAE Assorted ice cream Chocolate sauce Caramel sauce Strawberry sauce Candy toppings, nuts and cherries Waffle cones Whipped cream $12** THAT’S THE WAY THE COOKIE CRUMBLES Chocolate chip, peanut butter, oatmeal raisin, white chocolate macadamia and sugar cookies Assorted sodas, chilled whole and chocolate milk $10 FRUIT FESTIVAL Skewers of fresh fruit Seasonal whole fruit Yogurt dipping sauce Chocolate dipped fruit Assorted fruit juices $12* 7TH INNING STRETCH/STADIUM BREAK ITEMS Soft pretzels with cheese & mustard Peanuts and Cracker Jack® Tortilla chips, guacamole and fresh salsa Assorted candy and candy bars $11* A LOTTA CHOCOLATTA Double fudge brownies Assorted gourmet cupcakes Assorted boxed candies & candy bars Chilled whole and chocolate milk Chocolate mousse cups $12* THE LEMONADE STAND Lemon meringue tart Lemon squares Freshly squeezed lemonade and iced tea Lemon cookies $10* READY FOR ROUND TWO Assorted fresh fruits with yogurt, granola bars, protein bars, dried fruits & nuts Energy drinks $14 CHARCUTERIE BREAK Assortment of sausages, meats & cheese Curried antipasto artisan breads, garnish, and condiments $15 **Please see the attached document for a full list of our terms. Please contact us for a full list of our terms. SUNRISE CONTINENTAL BREAKFAST Assorted chilled juices Fruit salad Artisan breakfast pastries with butter and preserves Coffee and teas $15* DELUXE CONTINENTAL BREAKFAST Assorted chilled juices Seasonal fruit display Individual yogurts Artisan breakfast pastries with butter and preserves Scrambled eggs Coffee and teas $18* PINNACLE BREAKFAST BUFFET Assorted chilled juices Seasonal sliced fruits Scrambled eggs Cheese hash browns Country grits Artisan breakfast pastries with butter and preserves Crisp bacon and sausage links Assorted cereals Coffee and teas $21* PLANTATION BREAKFAST BUFFET Assorted chilled juices Seasonal sliced fruits Biscuits with sausage gravy Scrambled eggs Breakfast frittata Country grits Country breakfast potatoes Artisan breakfast pastries with butter and preserves Crisp bacon and sausage links Coffee and teas $23* ALL PLATED OPTIONS INCLUDE ASSORTED BREAKFAST PASTRY AND BREAKFAST POTATOES. ALSO INCLUDES FRESHLY BREWED CAFFEINATED AND DECAFFEINATED COFFEE AND HOT TEA **Please see the attached document for a full list of our menu options. Please contact ust for a full list of our terms. HOT PLATED LUNCH HOT PLATED ENTRÉE SELECTION INCLUDES YOUR CHOICE OF SOUP OR SALAD, AND ROLLS. ALSO INCLUDES FRESHLY BREWED CAFFEINATED AND DECAFFEINATED COFFEE AND ICED TEA. CHOICE OF PASTRY FROM CHEFS’ CREATIONS. PESTO PENNE Grilled squash, zucchini, peppers, and red onions with feta cheese $22 with chicken $3 with shrimp $4 PAN SEARED CHICKEN Served with a lemon basil caper sauce, herb roasted potatoes and seasonal vegetables $23 BLACKENED RED SNAPPER Lightly blackened and served with corn maque choux and rosemary roasted potatoes $25 GRILLED RIBEYE Served with caramelized onions and sautéed mushrooms, roasted garlic mashed potatoes and seasonal vegetables $28 CHICKEN MARSALA Chicken breast, mushroom gravy, Yukon mashed potatoes $24 BLACKENED CATFISH Mississippi catfish, braised greens, and grits. $24 HERB CRUSTED PORK LOIN Roasted sweet potatoes, haricot verts, tasso red eye gravy $22 PLATED SALADS CLASSIC CAESAR SALAD Crisp romaine hearts tossed with Parmesan cheese, garlic herb croutons with Caesar dressing $15 with chicken $19 with shrimp $23 COBB SALAD Crisp iceberg lettuce topped with ham, turkey, cheddar and monterey jack cheese, hard boiled eggs, tomatoes, cucumbers and bacon bits with ranch dressing $21 TENDERLOIN SALAD Tenderloin tips over crisp romaine hearts, sliced mushrooms, julienne red onion, and crumbled blue cheese dressing $23 WEDGE SALAD Fried chicken, tomatoes, cucumbers, red onion, and crumbled blue cheese dressing $19 PLATED SANDWICHES MUFFALETTA Sliced salami, ham, pepperoni, and Provolone cheese topped with olive salad $18 GRILLED CHICKEN Lemon pesto aioli, chicken breast, baby arugula, roma tomatoes on ciabatta bread $19 GRILLED VEGETABLES Served on a ciabatta roll with fresh Mozzarella, pesto aioli and baby arugula $17* HOUSE BURGER Cheddar, applewood bacon, dressed $22 CHICKEN SALAD Wrapped in a whole wheat tortilla with shredded lettuce and pepper jack cheese $16* ROASTED TURKEY OR GLAZED HAM Thinly sliced, topped with field greens, Brie cheese, and Dijon mayonnaise served on multi grain bread $18 **Please see the attached document for a full list of our lunch menu options. PLATED ENTREES PLATED ENTRÉE SELECTION INCLUDES YOUR CHOICE OF SALAD AND ROLLS. ALSO INCLUDES FRESHLY BREWED CAFFEFINATED AND DECAFFEINATED COFFEE AND ICED TEA. CHOICE OF PASTRY FROM CHEFS’ CREATIONS GRILLED MARINATED CHICKEN BREAST With roasted corn and pepper salsa, Creole rice and seasonal vegetables $29 ROASTED CHICKEN BREAST Stuffed with garlic and herb cheese au gratin potatoes, seasonal vegetables and roasted red pepper sauce $32 STUFFED PORK CHOP With baked macaroni and cheese, seasonal vegetable and chipotle BBQ sauce $34 SEARED CHICKEN BREAST Topped with tasso pan gravy, mashed potatoes and seasonal vegetable $30 SHRIMP AND GRITS Louisiana gulf shrimp and southern style cheese grits $32 PAN SEARED SALMON With garlic herb butter, potato puree, sauté of mushrooms and seasonal vegetables $34 FILET OF RED SNAPPER Lightly blackened with crawfish mashed potatoes, seasonal vegetables and Creole sauce $33 GRILLED NEW YORK STRIP STEAK With herb roasted potatoes, seasonal vegetables and wild mushroom demi-glace $42 ROASTED FILET OF BEEF With garlic puree of potatoes and seasonal vegetables $47 Add crab cake, scallops, or salmon $55 TROUT ALMANDINE Almond crusted gulf trout and brown butter. Served with roasted rosemary potatoes. $34 DINNER BUFFETS CAJUN BUFFET Louisiana seafood gumbo Tossed garden with a choice of dressings Cajun potato salad Golden fried catfish Crawfish etouffee sauce Shrimp and grits Whole new potatoes with parsley butter Corn maque choux Corn bread and butter Individual seasonal fruit cobbler Coffee and teas $43 PINNACLE BUFFET Onion soup Chopped salad bar with olives, onions, tomatoes, chopped eggs, bacon, blue cheese and choice of dressings Roasted portabella mushrooms with balsamic onions and peppers Orzo pasta salad with peas and sundried tomatoes Garlic stuffed standing rib roasted with cabernet jus Roasted chicken breast with Madeira sauce Seared salmon with tarragon and Dijon cream sauce Creamed spinach Rosemary roasted red potatoes Assorted artisan rolls Individual crème brulee, assorted cakes and assorted mousse truffles Coffee and teas $44 SEASONAL LOUISIANA BACKYARD CRAWFISH BOIL Chicken and Andouille sausage jambalaya Gulf shrimp etouffee with white rice Blackened catfish Cajun boiled vegetables Boiled crawfish Andouille sausage Red potatoes Corn on the cob Strawberry shortcake cups Pineapple upside down cake Key Lime Pie Coffee and teas $42 CARIBBEAN Conch chowder Mixed greens with tomatoes, onions, plantain chips and avocado ranch dressing Seasonal fruit salad Shrimp ceviche salad Jerk-roasted chicken Pan seared tilapia with grilled pineapple salsa Pork ribs with BBQ sauce Creole ratatouille Jasmine coconut rice Coconut macaroons Tropical panna cotta Coffee and teas $45* SEAFOOD JUBILEE Crawfish bisque Crisp iceberg lettuce with assorted toppings and dressings Peel and eat shrimp with cocktail sauce Crab salad Shrimp and pasta salad Crab cakes with remoulade sauce Cajun catfish with crawfish etouffee sauce Steamed snow crab claws with drawn butter Boiled potatoes with corn and sausage Corn muffins with whipped butter Bread pudding Individual strawberry shortcakes Coffee and teas $47* **Please see the attached document for a full list of our menu options. RECEPTION STATIONS ASIAN STATION Chinese-style chicken salad Hoisin glazed pork ribs Shrimp & broccoli in spicy garlic sauce Vegetable lo-mein Stir-fried rice $21 ITALIAN STATION Beef Carpaccio with shaved parmesan Chicken marsala Farfalle with broccoli and sun-dried tomatoes Eggplant parmesan with heirloom tomatoes Traditional Caesar salad with shaved parmesan Herbed focaccia $21 SOUTHERN STATION Honey BBQ chicken wings Catfish nuggets with spicy cajun tartar Crawfish hush puppies with corn salsa Mini barbeque sandwiches $22 CARIBBEAN STATION Pasta prima vera Black beans and rice Jerk chicken Fried plantains Coconut curry shrimp Braised greens $22 PASTA STATION Cashew chicken with spicy plum sauce Penne with chicken and pesto Rigatoni with sausage, garlic and rapini, fusilli with shrimp and sun dried tomatoes Vegetable lasagna Basil garlic cheese bread $19 PIZZA STATION Pepperoni, Vegetable, and BBQ chicken pizza Farfalle with broccoli and sun dried tomato sauce, Traditional Caesar salad with shaved parmesan Three herbed focaccia $21 CHICKEN AND BEEF FAJITAS Chicken and beef fajitas, charred peppers, tomatoes, flour tortillas, pico de gallo, guacamole, queso, sour cream, chopped onions & cilantro $21 ASSORTED HAND ROLLED SUSHI Chef selection of hand rolled sushi to also include maki rolls, nigri, and sashimi $20 CARVING STATIONS PEPPERCORN CRUSTED TENDERLOIN OF BEEF Dijon mustard Creamy horseradish, béarnaise Silver dollar rolls, au jus $350.00 | Serves 25 people STEAMSHIP ROUND OF BEEF Stone ground mustard Au jus, creamy horseradish Silver dollar rolls $475.00 | Serves 150 people SMOKED COUNTRY HAM Apricot mustard creole and Dijon mustard Silver dollar rolls $300.00 | Serves 40 people SMOKE HOUSE TURKEY Cranberry chutney and garlic aioli Silver dollar rolls $275.00 | Serves 30 people PRIME RIB Creamy horseradish, béarnaise Silver dollar rolls $375.00 | Serves 40 people LEG OF LAMB Rosemary and Dijon crushed Roasted garlic jus Silver dollar rolls $245.00 | Serves 35 people BBQ BRISKET Bourbon BBQ sauce Silver dollar rolls $175.00 | Serves 30 people SMOKED SALMON EN CROUTE Red onion jam Black pepper lavash Crème fresh Capers $325.00 | Serves 35 people COCHON DU LAIT Whole roasted suckling pig stuffed with jambalaya Mustards and assorted breads $425.00 | Serves 45 people ALLIGATOR Whole smoked alligator Fried & blackened alligator bites Remoulade Stone ground mustard Assorted breads $500.00 | Serves 45 people **Please see the attachment for a full list of our menu options. Breathtaking and beautiful, Blythewood is a greek revival mansion that is over 10,000 sq feet which stands on approx 10 acres. This mansion is the perfect setting for both your ceremony and reception, bridal shower, engagement party, corporate meetings, etc. We offer rental only packages as well as catered or both. Meaning, we can provide a partial menu and you may supplement the food with your "Uncle Joe's" famous jambalaya or etouffee that is a traditional item served at the reception." What we are saying is if you would like to bring in additional or all food items, you are allowed to, including alcohol, which most places do not allow. We are extremely flexible. Blythewood has bed & breakfast rooms if you need to house, family, friends, or even the wedding party. Our weekend weddings are our specialty. This consist of renting all the Bed & Breakfast rooms and we would not host any other events from Friday at 4pm till Sunday at 11am which gives you ample time for additional decorating, taking photos, preparing food, etc. Be sure and visit us on Facebook. The Event Center LaMaison Celebrazione is the most luxurious event venue on the Northshore. Able to accommodate anywhere from 100-1500 guests, our venue is perfect for any event. We offer our facility as use for weddings, receptions, awards banquets, meeting rooms, alumni events, dances, charity events, benefits, conferences, baby showers, anniversaries, birthday parties, sweet sixteen, and whatever you can imagine. At The Event Center LaMaison Celebrazione, your event is turn-key. 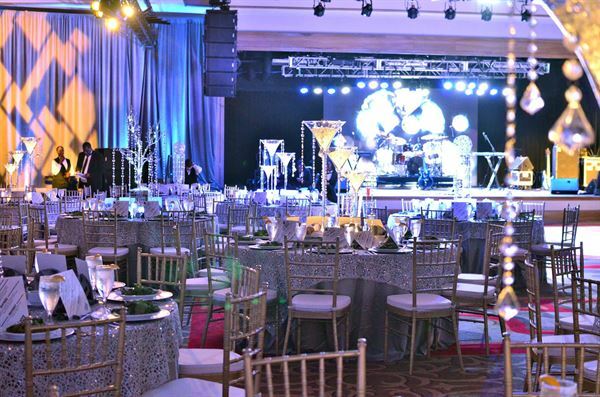 If you choose, our certified event planners will create the most spectacular occasion that you've ever attended. We will take care of everything from the moment you walk through our doors to tour the facility until your very last guest leaves at the end of the event. From the grand theme to the intricate details, we cater to you. Whether your planning a dream wedding or an important networking event, it should be classy and memorable. We make sure of it. We work with you and your budget to create the perfect experience. Contact our event coordinators today to check availability for your date or to schedule a tour of our beautiful event venue. The Guru is a unique private events venue in Baton Rouge located in the Circa 1857 complex on Government and 19th Streets just across from The Garden District. Housed in an original 1920s mechanics garage, The Guru is a fusion of funky and serene - a more intimate space with a New Orleans gallery feel. Perfect for parties of every description, dinners, small weddings and receptions, fundraisers, showers, acoustic music performances, art shows, meetings, recitals, classes and workshops. The Guru is a unique, inclusive venue with wonderful ambience and the best prices in town. We just finished major ($27M+) renovations and the Baton Rouge Marriott is a brand new and gorgeous property for your special occasion! Guest rooms, public & meeting spaces, pool, and restaurant & bar have all been redesigned with the comforts and conveniences of modern hospitality to make your stay more enjoyable and your event more memorable. The Baton Rouge Marriott is conveniently located off of Interstate 10 in the heart of the city – we’re only 4 miles from Louisiana State University, 5 miles from the Louisiana State Capitol and just 60 miles from New Orleans and Lafayette. With 299 guest rooms and over 20,000 square feet of elegant meeting/event spaces, our property is the perfect fit for various special events from conventions to weddings. Our culinary and event staff eagerly await to help you plan and flawlessly execute your next function with unparalleled service. Contact us today to find out how we can make your next occasion a success! This old rustic style plantation home sits among beautiful Live Oak trees. The landscape is absolutely stunning. Oakleigh House has a large deck that steps down to a stone patio area that gives the bride and groom a chance to spend their special day inside or outside. The loft is used for a dressing room for the bride and her bridesmaids for her special day and the groom has a room down stairs for him and his guys. The Oakleigh House has a large kitchen. You can have your event catered or bring your own food. The kitchen has a large covered area in the rear for outdoor cooking.